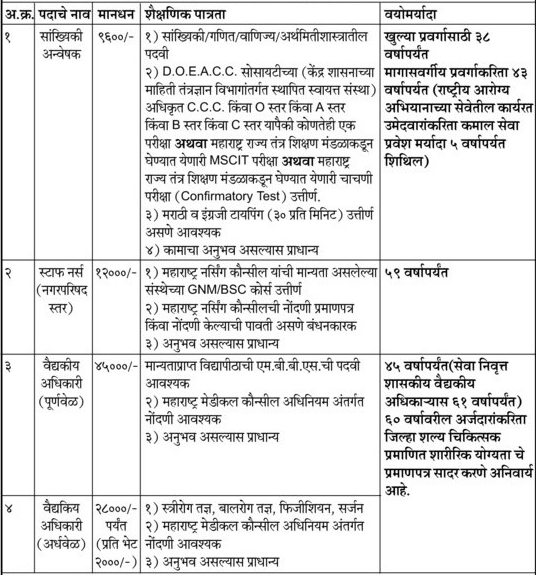 Thane Arogya Vibhag (ZP Thane Health Department), Thane published a new job notification for Statistics Investigator, Staff Nurse, Medical Officer Posts. The recruitment is for total 10 Vacancies. The willing candidates are informed to see the latest notification March 2019. Walk-in Interview on 15-03-2019. For More details of Thane Arogya Vibhag Recruitment 2019 Read Below. Thane Arogya Vibhag (Public Health Department Thane), Thane published a new job notification for Warden, Laboratory Scientist Officer, Laboratory Assistant, X – Ray Expert, Blood Bank Technician, Pharmacist, Dietitian, Nurse, Phone Operator, Driver, Shampi, Plumber, Carpenter, Archivist, Junior Clerk, Electrician, Assistant Nurse & Senior Clerk Posts. The recruitment is for total 366 Vacancies. The willing candidates are informed to see the latest notification February 2019. Last Date of online application is 10-03-2019. For More details of Thane Arogya Vibhag Recruitment 2019 Read Below. Age Limit: 18 to 38 years for backward category applicants upper age limit is 43 years. For reserve category applicants need to pay Rs.300/- as applications fees. Application starts online 24-02-2019. Last Date of application is 10-03-2019.